04/10/2016: Added a MAC 5-Piece Short Box-End Wrench Set. 03/01/2016: Added a MAC B5 Short Box-End Wrench. 02/04/2016: Added a MAC B7 Short Box-End Wrench and a MAC CHLF22 Flex-Box Combination Wrench. 02/01/2016: Added a MAC B9 Short Box-End Wrench and a MAC M14CHLF Flex-Box Combination Wrench. 01/31/2016: Added a MAC C8 Combination Wrench and a MAC B99 Angled Box-End Wrench. 01/30/2016: Page created, no content yet. MAC Tools is a full-service tool company in operation since the mid 1940s. MAC Tools was formed in 1945 with an unusual structure, basically a marketing cooperative of three closely held but quasi-independent companies. The earliest component of the triad had been founded in 1938 as the Mechanics' Tool & Forge Company and operated in Sabina, Ohio. The second component, the Clinton Tool Company, was founded in 1944 to manufacture sockets and drive tools. The third component was founded in 1945 as Mac Allied Tools and operated in Akron, Ohio. The "MAC" name was derived as an acronym from "Mechanics Allied Clinton". One of the hallmarks of MAC's early production was the use of hand forging, a process by which steel is shaped by repeated blows of a power hammer under relatively low heat. This contrasts with drop-forging, in which a red-hot billet of steel is forced into a die with a single blow of a drop hammer. Advocates of hand forging maintain that the repeated blows and lower temperature are better at refining the steel grain structure, resulting in stronger tools. MAC Tools is one of a small number of tool companies to offer "tool truck" service for professional mechanics. 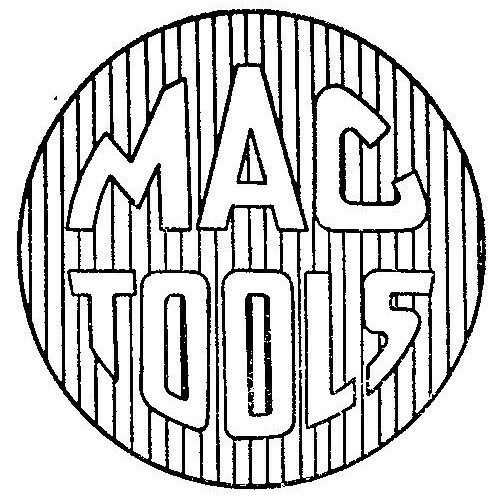 By the early 1960s Mechanics' Tool & Forge had changed its name to MAC Tools, Incorporated, and Clinton Tool had apparently been absorbed into MAC Tools. Mac Allied Tool maintained its separate management, however. In 1979 MAC Tools and Mac Allied Tool severed their relationship. After the split, Mac Allied Tool was reformed as the Matco Tool Corporation and subsequently operated as MATCO. MATCO offers a full-service line of tools to professional mechanics, complete with "tool truck" service. In 1980 MAC Tools was purchased by The Stanley Works, a conglomerate holding a number of other tool companies. MAC Tools continues today as a division of Stanley, and interested readers can find further information on the company and its products at the MAC Tools [External Link] web site. MAC 01/01/1939 08/01/1946 06/22/1948 439,367 Block letters. 07/01/1945 11/12/1953 01/18/1955 600,993 Used for socket sets, wrench sets, other tools. MAC began marking a date code on tools in 1975, using a code consisting of a letter followed by a number in the range of 1-4. Since this site is mostly interested in older tools, we won't have much occasion to refer to the date code system. However, the absence of a date code will at least be useful to identify tools made before 1975. For tools without a date code, we will try to develop guidelines for estimating the manufacturing date. Currently we have only limited catalog resources for MAC, consisting of catalogs from 1951 and 1988. Early MAC tools were frequently marked for the company's Sabina, Ohio location. We have a number of examples of early MAC tools and will expand this section as time permits. Fig. 1. MAC C8 11/16 Combination Wrench, with Insets for Side View and Reverse Detail, ca. Mid 1940s to 1950s. Fig. 1 shows a MAC C8 11/16 combination wrench, stamped "MAC" with the model number and fractional sizes on the shank, with "Sabina, Ohio" and "U.S.A." on the reverse. Fig. 2. MAC B99 3/4x7/8 Angled Box-End Wrench, with Insets for Side View and Reverse Detail, ca. Mid 1940s to 1950s. Fig. 2 shows a MAC B99 3/4x7/8 angled box-end wrench, stamped "MAC" with the model number on the shank, with "Sabina, Ohio" and "U.S.A." on the reverse. The overall length is 11.7 inches, and the finish is cadmium plating. The next several figures show individual box-end wrenches acquired as part of a five-piece set in a leatherette tool roll, followed by the full set itself. Fig. 3. MAC B5 1/2x9/16 Short Angled Box-End Wrench, with Inset for Side View, ca. Mid 1940s to 1950s. Fig. 3 shows an early MAC B5 1/2x9/16 short angled box-end wrench, stamped with "MAC" and the model number on the shank, with one fractional size at the left and the other size on the reverse. The overall length is 6.3 inches, and the finish appears to be cadmium plating. Fig. 4A. MAC B7 5/8x11/16 Short Angled Box-End Wrench, with Inset for Side View, ca. Mid 1940s to 1950s. Fig. 4A shows an early MAC B7 5/8x11/16 short angled box-end wrench, stamped with "MAC" and the model number on the shank. The wrench is also stamped with the fractional sizes, with one on each side. The overall length is 6.9 inches, and the finish appears to be cadmium plating. Fig. 4B. MAC B9 3/4x7/8 Short Angled Box-End Wrench, with Inset for Side View, ca. Mid 1940s to 1950s. Fig. 4B shows an early MAC B9 3/4x7/8 short angled box-end wrench, stamped with "MAC" and the model number on the shank. The wrench is also stamped with the fractional sizes, with one on each side. The overall length is 7.7 inches, and the finish appears to be cadmium plating. Fig. 5. MAC 5-Piece Short Box-End Wrench Set, ca. Mid 1940s to 1950s. Fig. 5 shows an early MAC 5-piece short angled box-end wrench set in a leatherette roll, marked with "Mechanics Tool and Forge Co." and "Sabina, Ohio" on the retaining band. The individual wrenches are stamped with "MAC" plus the model number and fractional sizes, as shown in the prior figures. The overall width and height of the set as shown are approximately 6.4 by 9.2 inches, and the finish of the wrenches appears to be cadmium plating. The wrench models and sizes are B2 (1/4x5/16), B3 (3/8x7/16), B5 (1/2x9/16), B7 (5/8x11/16), and B9 (3/4x7/8). Note that the two smallest wrenches have 6-point openings, with the larger three have 12-point openings. 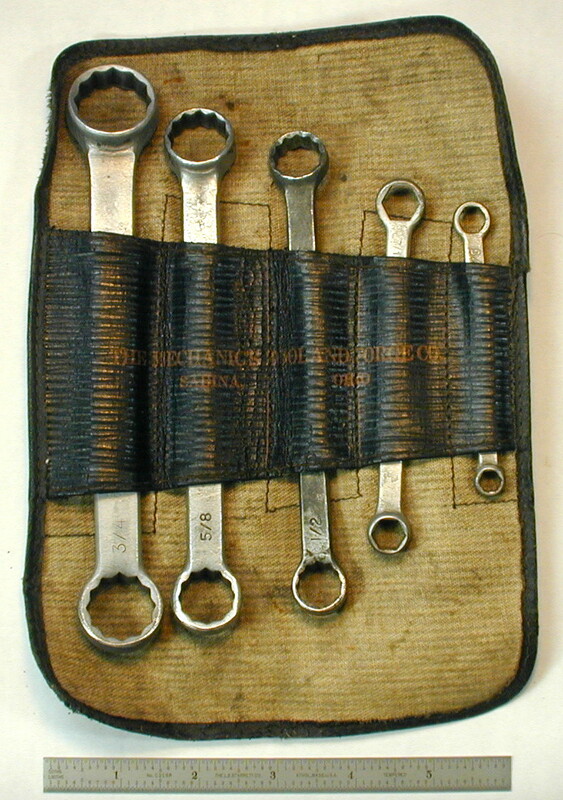 Currently we don't have a catalog reference for this set, but the 1951 catalog shows a similar set of offset box wrenches, suggesting a late 1940s or 1950s manufacturing date. Fig. 6. MAC CHLF22 11/16 Flex-Box Combination Wrench, with Insets for Side View, Reverse, and Construction Detail, ca. 1960s to 1970s. Fig. 6 shows a MAC CHLF22 11/16 flex-box combination wrench, stamped "MAC" and "Sabina Ohio" with the fractional sizes on the shank, with the model number on the reverse. The overall length is 10.8 inches fully extended, and the finish is chrome plating. The socket of this wrench has a hexagonal broaching (see middle inset), giving it improved gripping on damaged nuts, but restricting its use in tight spaces. Fig. 7. MAC M14CHLF 14mm Flex-Box Combination Wrench, with Insets for Side View and Reverse Detail, ca. 1960s to 1970s. Fig. 7 shows a MAC M14CHLF 14mm flex-box combination wrench, stamped "MAC" with the metric sizes on the shank, with the model number and "USA" on the reverse. The overall length is 8.7 inches fully extended, and the finish is chrome plating. The socket of this wrench has a hexagonal broaching, giving it improved gripping on damaged nuts, but restricting its use in tight spaces.